"The joy in their faces is pretty amazing." We are on a mission to stimulate and expand the imaginations of students in our local communities. We provide arts-deprived public school students access and exposure to world-class New York City arts and culture experiences. We deliver at least two experiences to each student each year. Hands-on activities that integrate technology with the arts deepen student encounters and inspire even more. 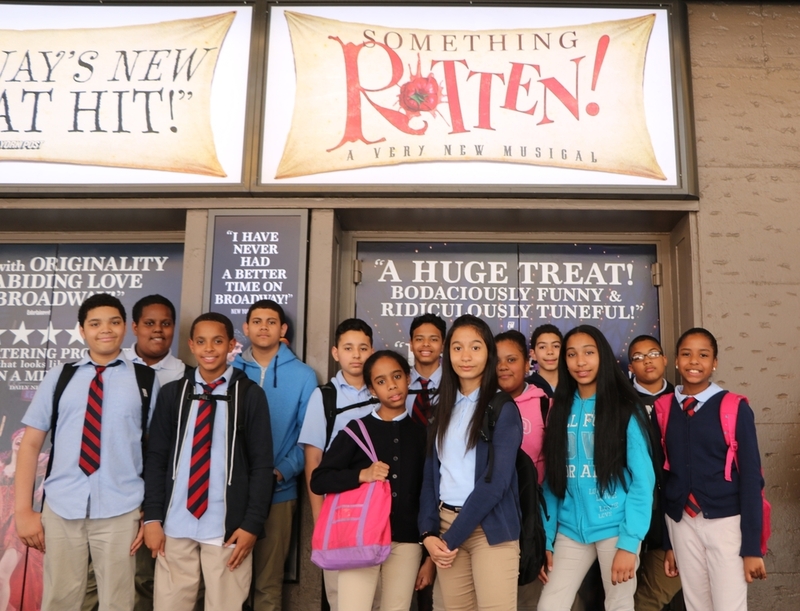 We take every student in our partnering NYC middle schools to see two Broadway-level productions, culminating in a repertoire of six shows by their graduation from 8th grade. Artist talk-backs, sessions with working professionals, and on-site educational seminars allow our students to meet and see these professionals as real human beings who made choices, worked hard, and achieved success. Experiences take students beyond standardized learning. The kids who are doing the most with the least deserve extra support. New York City's abundance of cultural offerings are the birthright of each NYC student, no matter her/his socio-economic background. We have a moral obligation to support our local communities. Our students need imagination; our cultural organizations need future audience development; our communities need productive citizens. It's a cycle. In 2011, M.S. 343 had scored at the top of its district for 5 years running, despite its location in the poorest congressional district in the country. Principal Vincent Gassetto was looking for ways to continue the success and reward the students. Someone needed to step in to support the school... and that's exactly what Damian Bazadona, President of Situation Interactive, did. Using funds slated for holiday gift baskets for clients and partners, Situation sent the entire school to see Spider-Man: Turn off the Dark - a significantly more impactful gift! Before this, most of these students had never been on a field trip, much less seen a Broadway show. The Spider-Man company were so moved by the school's presence that they organized a day of Spider-Man at the Bronx school, where performers and technicians spoke to the students in small groups. The highlight was at the end of the day, when cast members performed songs from the show in the auditorium. School trips to world-class arts and culture. Access to working arts professionals. Situation Project was born.